Ben Robinson|GoBuccs.com Covington’s Lauren Christian gets off a shot against National Trail Thursday night. Thursday’s narrow 64-63 win in double-overtime over National Trail wasn’t Covington’s best performance of the season by any means, but it was the type of game that could galvanize the Lady Buccs for a long tournament run —- depending on how they handle it. Yes, on paper National Trail should have been a relatively easy win as the Blazers came into the contest with an 11-9 record overall and a sub-par 4-7 record in Cross County Conference play —- while Covington fielded a 16-3 record and stood at 9-2 in the CCC. But National Trail proved it is a much better basketball team than its record by playing very inspired basketball for four quarters and two extra frames. The Lady Blazers didn’t blink an eye against the firepower Covington presented on what was their “Senior Night”. National Trail jumped out to a lead and every time Covington made a run the Lady Blazers responded at every turn. To set the tone, National Trail came out of from the opening tip on fire —- building a 15-6 lead before Covington was able to close the gap to 15-10 on a bucket by Sammi Whiteman and two free throws by Lauren Christian. On a very quick inbounds pass by National Trail, Hamilton snuck behind the Blazer ball handler and tipped the ball away to teammate Claudia Harrington. Harrington quickly passed the ball across court to junior Morgan Lowe, who spotted up and hit a huge trey to cut the deficit to 41-34 with just under 30 seconds left in the third. After a defensive stop at the other end, Whiteman was fouled and hit both free throws to cut the margin to 41-33 with one quarter to play. Seconds later Lauren Christian picked up her fifth foul, depleating Covington’s bench. 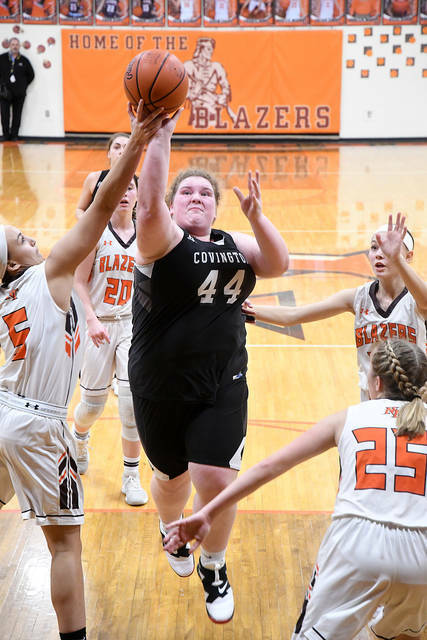 After a Blazer timeout to discuss strategy, National Trail had two open looks at the basket before the ball bounced off the rim and into the hands of Sammi Whiteman – who dribbled to mid-court as the buzzer sounded. 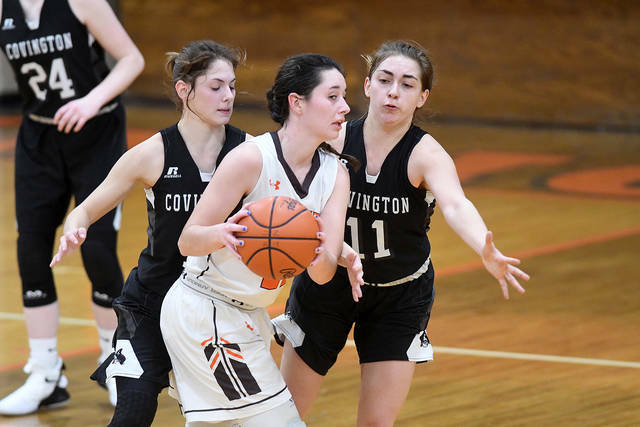 In the end, it was a case of Covington finding a way to win – even though it didn’t play its best basketball. With the win, Covington shared second place in the CCC with Miami East and Franklin Monroe. 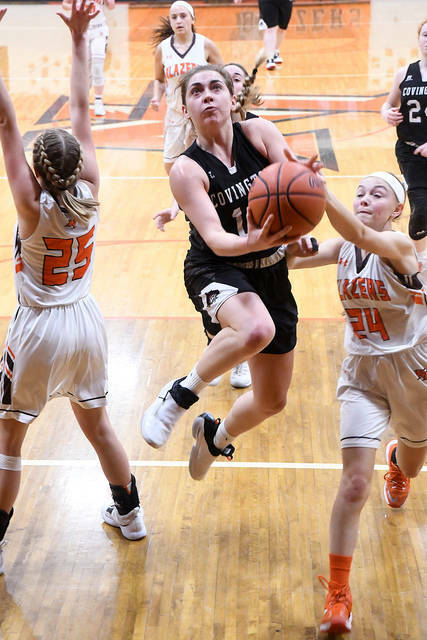 https://www.tdn-net.com/wp-content/uploads/sites/21/2019/02/web1_lauren-christian-1.jpgBen Robinson|GoBuccs.com Covington’s Lauren Christian gets off a shot against National Trail Thursday night.